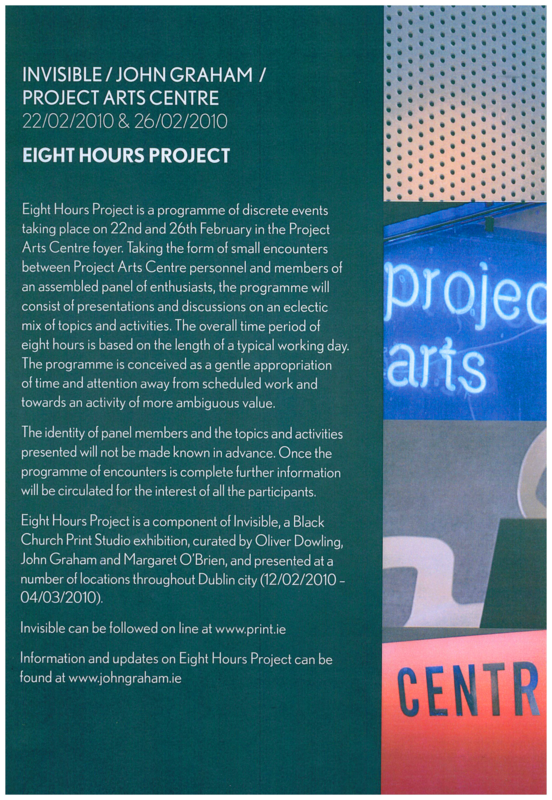 Eight Hours Project was a programme of discrete events on 22nd and 26th of February in the foyer of the Projects Arts Centre, Dublin. Taking the form of small encounters between Project Arts Centre workers and members of an assembled panel of enthusiasts, the programme consisted of presentations and discussions on an eclectic mix of topics and activities. The overall time period of eight hours was based on the length of a typical working day. The programme was conceived as a gentle appropriation of time and attention away from scheduled work and towards an activity of more ambiguous value.